During this long, President’s Day weekend, I was looking for ways to shake-up the spaghetti and marinara I seemed to be eating all the time. 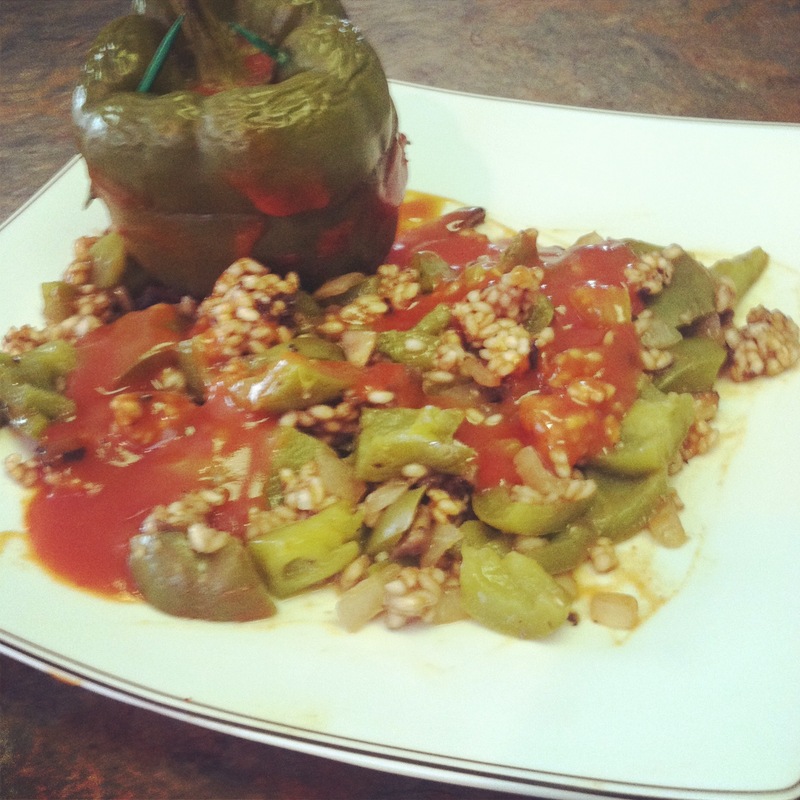 I wanted to try something new and eggplant is something I did not have a lot of experience cooking. If you have never cooked with eggplant, try not to get freaked out by the brown seeds. Those are normal. And it is important to extract as much liquid from the eggplant when you press it between the paper towels. This will provide you with the best roasted flavor and texture as possible. Place eggplant in colander, sprinkle evenly with salt and let stand for approximately 2 hours. Rinse salt from eggplant and press firmly between triple-layered paper towels. Toss eggplant and olive oil together in a large mixing bowl. Sprinkle garlic powder on top of eggplant/olive oil mixture, making sure to coat evenly. Spread in single layer on large baking sheet. Roast for approximately 30 minutes or until tender and brown. Stir every 10 minutes. Allow eggplant to cool when done. Separate into two, ½ cup servings (It is important to measure the eggplant after it is cooked because the size and weight of eggplant changes dramatically after it has been cooked). Set one serving aside for sauce. 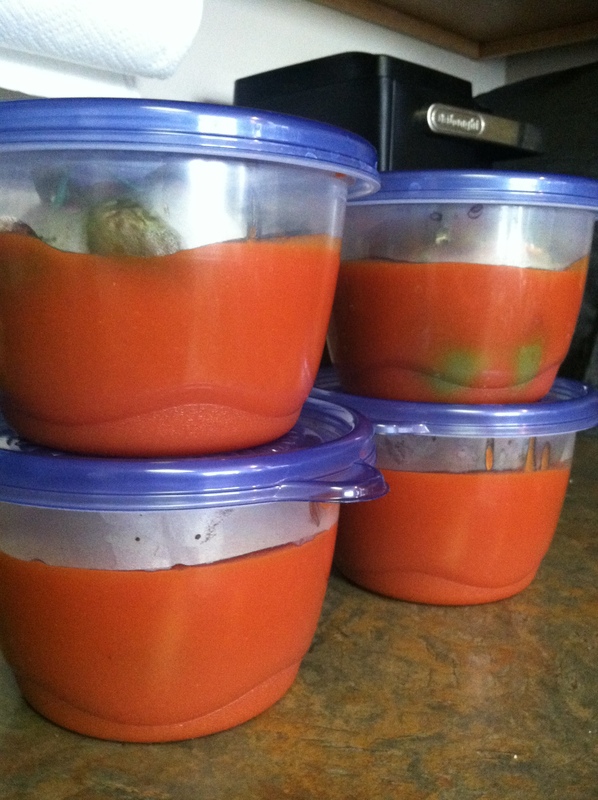 Store the second serving in the refrigerator until ready to eat at a later time. 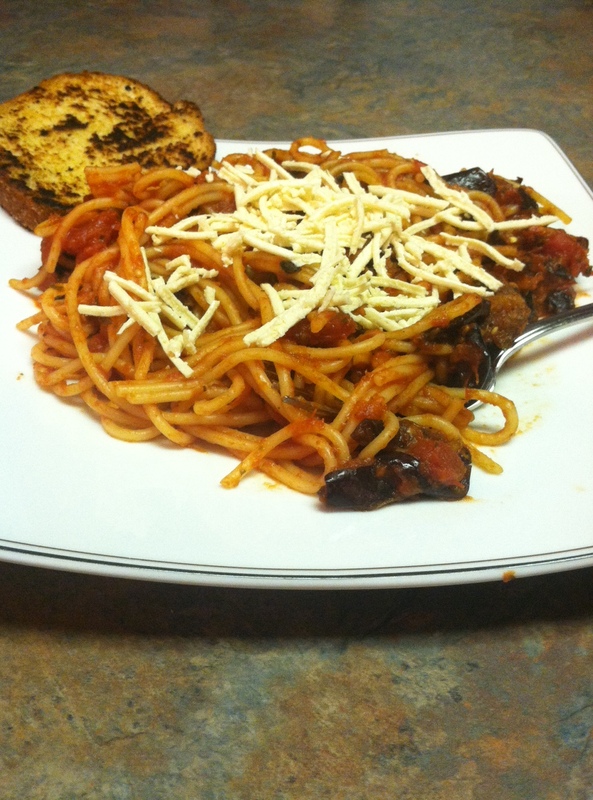 Toss remaining ½ cup of roasted eggplant and 1 cup of pasta sauce into a sauce pan on medium-high heat. Once sauce mixture is warm, serve on top of low-protein Aproten Spaghetti noodles. My oven seemed to run a little hot for 500 degrees and I did not really need to roast my eggplant for a full 30 minutes. 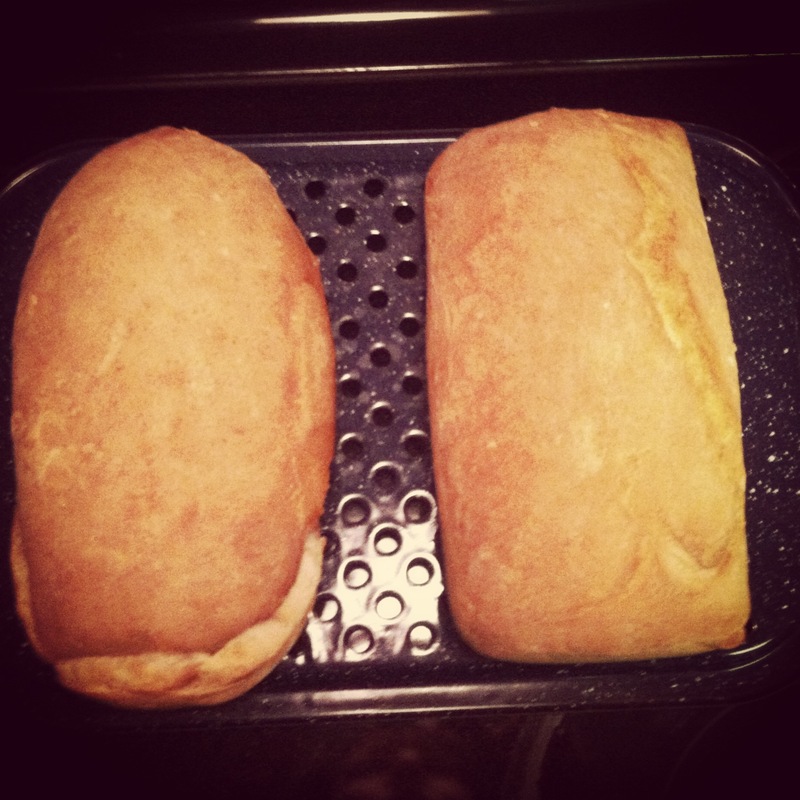 In fact, I would venture to say that mine turned out slightly over cooked; however, I will get better with practice. Just watch the eggplant closely as you roast it on the baking sheet and if you feel that it is getting heavily browned, then remove it from the oven. Whenever you prepare to eat the left-over portion of the roasted eggplant, simply repeat the last two steps in the directions listed above. Depending on your preference, you may also want to top the dish with Daiya Mozzarella Shreds and serve with low-protein garlic bread. Tervis Tumbler + Olive Garden = Awesome PKU Dining Experience! Earlier this week, I ventured out for my first restaurant meal since returning to the PKU low-protein diet. I was meeting my mother for lunch and we selected Olive Garden because we knew the unlimited salad (minus croutons and cheese) would be very PKU friendly. I also had the idea to bring some of my Aproten low-protein noodles with me. I had a batch already cooked and sitting in a Tupperware container in my refrigerator so all I had to do was re-heat them and find a way to transport the noodles while still keeping them warm. I immediately thought about a casserole dish/thermal carrying tote combo that I have, but I didn’t like the idea of walking through the restaurant carrying a large dish. 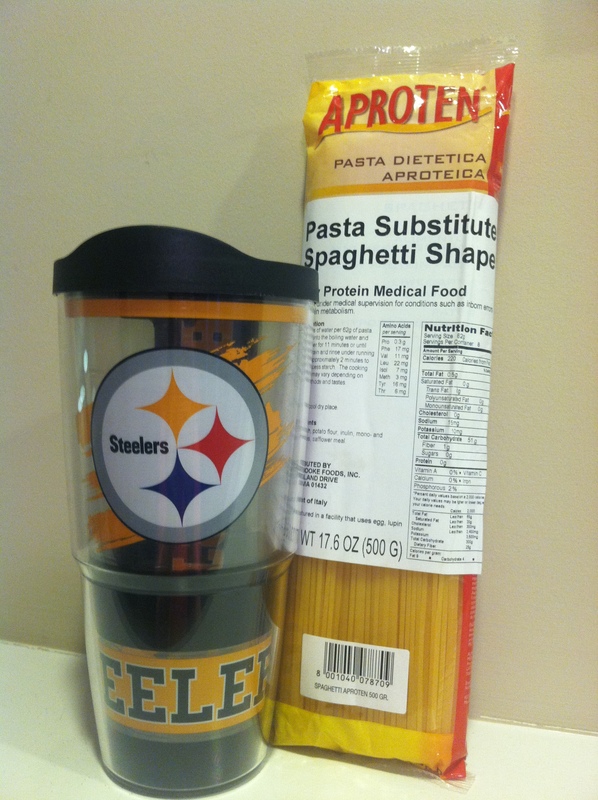 An insulated Tervis tumbler is a great way to transport low-protein noodles when eating out on a PKU diet. What did I do next? Well, this may sound a little silly, but I transferred my noodles into a Tervis tumbler. If you aren’t familiar with the brand, Tervis tumblers have a double-walled design that allows the air in between to keep hot drinks hot and cold drinks cold. Knowing about the tumbler’s insulated properties, I thought it might also be feasible that the tumbler would keep my noodles warm. Even better was that after sealing the tumbler with its tight-fitting travel lid, I was able to discretely carry the noodles in my purse (For the record, I do carry a very large purse!). When I ordered my meal, my mother and I explained to the waitress that I had special, dietary needs and asked if it would be possible to order just sauce and an extra plate. Specifically, I wanted to order the sauce that came with the Penne Rigate Pomodoro, a mixture of roma tomatoes, garlic, fresh basil, extra-virgin olive oil and marinara sauce. Rather than charging me full-price for the dish, the Olive Garden staff was kind enough to provide me the Pomodoro sauce at the cost of two dipping sauce orders. When our entrees arrived, the waitress brought an extra plate and two dipping saucers full of Pomodoro sauce. I grabbed the Tervis tumbler from my purse, dumped the noodles on the empty plate and covered the noodles with the sauce. Over all, I had a completely awesome experience and I give the staff at the Knoxville/Turkey Creek Olive Garden mad props for helping to make my dining experience as pleasant as it was! Finally, in closing here’s an update on how my return to diet is going: Yesterday marked three weeks since returning to the low-protein diet. My first on-diet blood level, taken on Jan. 27, came back at 4.3 mg/dl. That’s right in the ‘sweet spot’ of my clinic’s desired treatment range between 2 and 6 mg/dl. I was definitely impressed at how quickly my phe levels dropped, especially considering the last level I had prior to returning to diet was 20 mg/dl. I’ll be taking another level later today since my goal is to send a level to my clinic every two weeks. I’ve said this before on PKU Parlor, but the ability to plan and organize is going to be instrumental for me adhering to the low-protein diet. And if you know me, then you know I have affinity for being obsessed with organization. After 10 coats of magnetic primer and two quarts of chalkboard paint, I have successfully turned one wall of my laundry room into a customizable reminder/menu board. 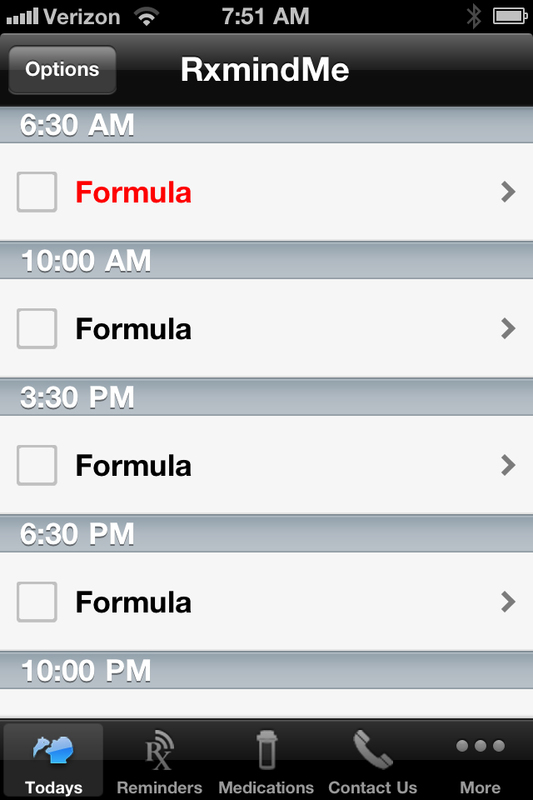 You may recall that in my last post, I briefly mentioned that I intended to plan-out my menu a week at a time. 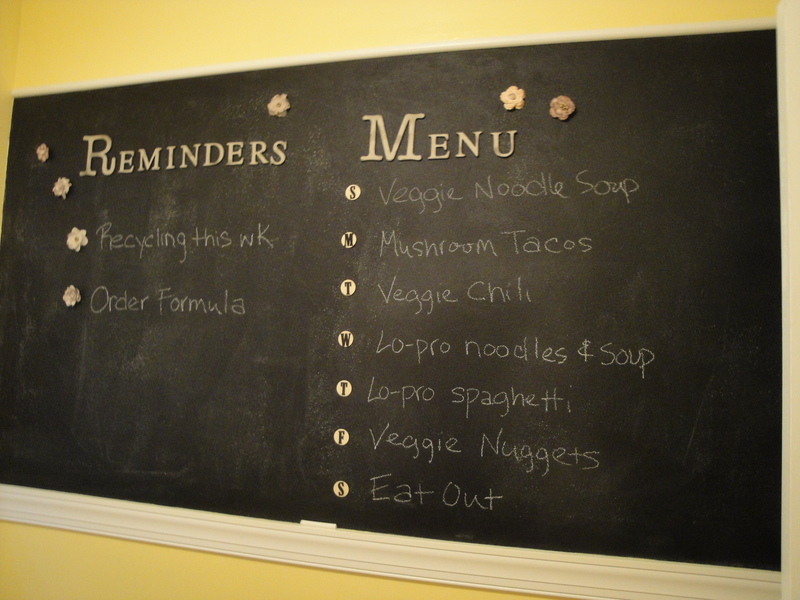 As you can see here, after I completed my grocery shopping, I jotted down the menu items on this chalkboard wall as a way to remind myself of any items left for eating as I get further into the workweek. At the end of the week, I erase the items and start all over again. The left-hand side of the board has a special section reserved for reminders, both PKU-related and non-PKU related. Now it’s worth noting that planning a low-protein menu a week at a time can be challenging. Among other items, it demands a ton of fresh produce and an arsenal of spices for livening up what otherwise might be considered bland, low-protein foods. Since I don’t want to lose track of all the hard work put towards menu planning, I also plan on creating an electronic database of meal plans. I haven’t created the database yet, but when I do, I’ll likely create it using Microsoft Excel and include columns noting phe amounts and whether the recipe calls for low-protein products. The last of these discriminators will prove valuable for those moments when I find myself running low on low-protein foods and need to get through the coming week eating whatever is available in local grocery stores. As I conclude this post, allow me to reflect on what today marks one week since first cutting out all high-protein food items in my diet. I agree that I feel better. That’s hard for me to admit since I prided myself for so long as someone who could eat whatever and still function at a high level. One of the harder things for me to do mentally is to stop counting calories and start to worry more about protein. I realize that eating low-protein won’t always align with low-calorie so I’m having a bit of a struggle letting go of that. PKU Letter Campaign to HHS Makes an Impact! There’s some good news to report in the PKU community: the Health and Human Services letter writing campaign–initiated by the National PKU Alliance aimed at ensuring that every state’s essential health benefits plan provides coverage for medical foods–has made a difference. This article, originally published in Congressional Quarterly’s Healthbeat News on Dec. 21, 2012, provides more details about how those comments have been received. Parents of children with rare diseases, advocates of acupuncture and other individuals are beginning to flood the Department of Health and Human Services with pleas and complaints about which specific services should be included in states’ essential health benefits packages. Public comments on a proposed rule on essential health benefits aren’t due until Dec. 26, but more than 1,000 responses already have been received, according to the government website where the reactions are posted. Nearly all the comments so far are from individuals rather than organized groups or health business interests, though those groups also are starting to weigh in. The letters from worried patients, doctors and family members across the country are an indication of the intense interest not just within the health industry but also among members of the general public – many with diseases or chronic conditions – in the outcome of decisions on benefit packages, which will vary from state to state and have a major impact on some people’s lives. More than 11,000 comments had been filed in response to a bulletin issued on benefits before the rule was unveiled a month ago. Some writing in are also asking for more time for comments to be gathered, saying that 30 days stretching over the holiday season isn’t enough time for people to digest a 119-page proposed rule and offer input on what should be changed. “Thirty days during the holiday is poor timing,” said an anonymous comment that suggested 90 days instead. 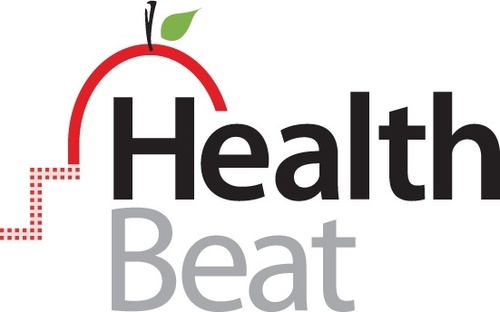 On Nov. 20, the Centers for Medicare and Medicaid Services released its proposed rule (See related story CQ HealthBeat, Nov. 20, 2012) establishing the essential health benefits required under the health care law (PL 111-148, PL 111-152). Non-grandfathered health plans offered inside and outside exchanges must, under the law, include benefits in 10 broad categories of services. State officials are supposed to pick a benchmark plan in their state as a model. HHS included some additional specific details on benefits in its proposed rule, but many commenters want more. Dozens of people have written in already asking that coverage of medical foods be included for patients with PKU, a rare, inherited metabolic disorder in which the body can’t process the amino acid phenylalanine. Treatment must be started early in order to avoid damage to the body and involves a special diet, according to the National PKU Alliance. Aleksandra Pisarek wrote that she is the mother of an 8-year-old boy with PKU who will require lifelong treatment to avoid brain damage. “Failing to ensure coverage for medical foods discriminates against people with PKU based on their disability,” she wrote. The National PKU Alliance has urged members to write HHS, noting that the decision on medical foods may be left up to each state unless the government requires coverage of medical foods as part of the essential benefits category that covers chronic disease management. “Representatives from the NPKUA recently met with HHS on this issue, and HHS urged us to have as many people as possible submit comments on the new regulations,” the alliance’s website states. Another group whose members sent many letters to HHS are those who receive or administer acupuncture treatment. Patricia Solomon, a Massachusetts pediatrician, said that “some of my most aware and careful parents seek acupuncture” and other alternative health treatments for their children. She said she was dismayed to see no alternative treatments included in the standards outlined for benefits. “Their value as adjuncts to traditional medicine is becoming clearer,” Solomon said. Stephen Scholle, the clinical director of a nonprofit that serves mental health consumers in Westchester and Rockland counties in New York, said his group provides acupuncture and should be included in essential health benefits, perhaps as part of wellness and preventive care. It helps with stress relief, pain relief and mental well-being, Scholle wrote. Another commenter, Terri Bukacheski, said she is concerned that rehabilitative services and devices that are required to be provided in one essential benefits category are not well-defined. “Patients that require prosthetic limbs and orthopedic braces require these custom services for a lifetime, and the care must be provided by highly skilled experts,” she wrote. Devices should be clearly defined to include prosthetic and orthotic services, she added. The time period for submitting comments in response to the “Patient Protection and Affordable Care Act: Standards Related to Essential Health Benefits, Actuarial Value, and Accreditation” rule has passed; however, visit the National PKU Alliance website for more information on how to support future advocacy efforts.